Sue asked us to create haphazard plus sign blocks for May. I really enjoyed digging through my scrap bin to find bits of fabric from some of her favorite designers, and I got to use some new low volume fabrics that I just received in a swap! Sue mentioned that she would be happy to trim the four blocks to 8.5-inches and sew them into the larger final block to allow her to balance out colors and prints, so I am taking her up on that offer! Sue’s question for May is: Where do you look for quilting inspiration? Share a favorite blog, book, magazine, instructor/class, etc. Favorite blogs for inspiration: Renee @Quilts of a Feather and Judy @Quilt Paradigm are both quilting friends, and I admire their brave free motion quilting that they accomplish on domestic machines. I am continually inspired by what they quilt! Instructor / Class: I also recently took a class with Angela Walters on Quilting Negative Space and really enjoyed it. Quilt Design: In terms of quilt design, I enjoy participating in the Facebook Group Quilt Design a Day (QDAD). Back in December I set 15 Quilty Resolutions for 2015, and I invited you to join me in making quilting resolutions for the year. I wanted to check int and report back on some of my progress so far this year. Participating in the Stash Bee was one of the ways I wanted to be more interactive (#8) this year, and I have to admit that I look forward to the first of every month and getting to sew blocks for other people. It has been a wonderful experience so far! How are things going for you this year? Are you making the kind of progress you were hoping? 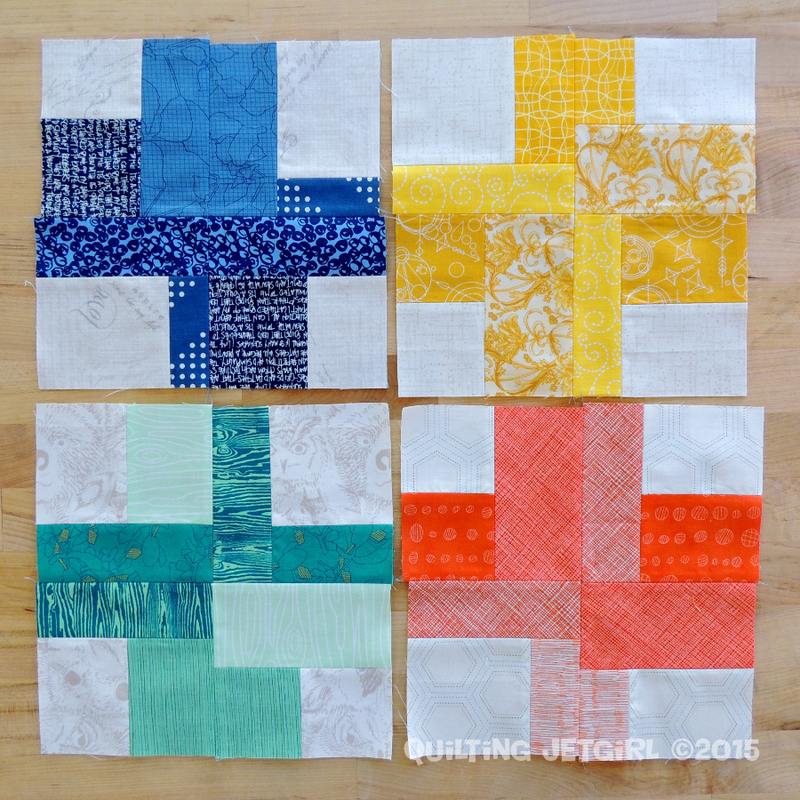 I just found your blog recently so didn’t think about quilting resolutions. Around Jan. 1st I did think of a word to work with/toward this year. It was “minimize” and I intended it to apply to all parts of my life – to minimize the amount of clutter, to minimize my stash, to minimize the quantity of food I was eating, etc. i have made some progress, not as much as I would like but some and that’s better than none. That Quilt Bliss cabin looks AWESOME!!! I’m not sure if I can get away this fall, but I’m glad to know that retreat exists, and I’ll watch for future class lineups there. These blocks are so vibrant! Good choice of scraps. My general rule of no orange or yellow with teal doesn’t even feel broken here! We’ve decided to refinance the house and buy down a lower rate, so the only way I’ll realistically be able to get a long arm this year is if I inherit a good amount from my grandma (but have no idea when or how much it will be). I’ve made more clothes, stayed away from big swaps and signed up for a retreat. I did try to destash some fabric and was partially successful…but I still have two small bins of fabric I don’t want, so I need to follow through on what to do with it. The bed quilt I want to make might get started next month. My plan for this month is to finish the banner, make your mini and paint the livingroom. I did purge my scraps, I put like colors together in clear bags to donate to our local thrift shop. It was a big step, since I had to get rid of any fabric, but I know I will not use them and it could make someone else happy! I will finish the UFO’s this year. I think Sue is going to love those blocks. Love the colors you selected. I would really like to find a quilting retreat to go on somewhere that is closer to me. I think I need to do some research. I saw your blocks on Stash Bee and loved the bright colours. You and I are among the eager beavers – always among the first to finish our blocks. Love the plus blocks and the wonderful colors. I really like the pattern for the bee blocks and the fabrics you used look so good. That retreat looks AMAZING! I hope you enjoy it! Great idea on those blocks!Time to dig through my scraps. Making slow progress on my resolutions this year–everything takes a lot of time! These blocks do look fun to do. Can’t wait to get started! Love those bee blocks – they look like great fun and scrap bin friendly too! What lovely, fresh blocks for your bee. And your quilt retreat looks amazing. One day maybe I’ll get to go to one somewhere over here!